blind men and elephant fish 맹인들과 코끼리 물고기: "Fat Boy" and his big mouth. I generally shy away from boisterous rhetoric but I'll admit that the rantings of Julius Malema have kept me coming back for more. Having previously lived in South Africa, and with plans to return, the prospect that he could ever wield true power in South Africa truly frightens me. So although on principle I am against the practice of labeling any speech a crime, it was reassuring to see Malema convicted of hate speech earlier this week because it was a sign (I hope) that South Africans themselves are beginning to tire of his irresponsible outbursts. 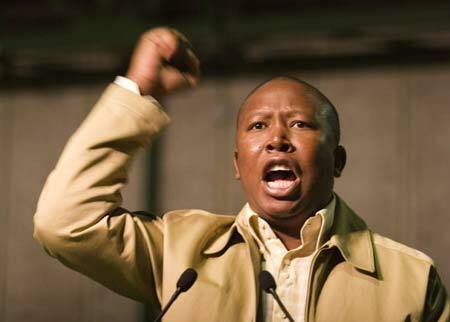 On the other hand the existence of a Malema in South Africa should not be suprising to anyone. The anger that he represents is not illegimate. There is much over which poor South African's can be righteously furious; corruption, politician's broken promises, and callous middle and upper classes to name but a few of those legitimate grievances. Nor is Malema's hypocrisy without precedent or contemporary comparisons. Apartheid was hypocrisy incarnate and many of those who benefited from that regime continue today to be almost criminally indifferent to the poor, feeling no responsibility for, or guilt over, the yawning socio-economic gap between themselves and their poorer black countrymen. This is disgraceful. However, in the same way that righteous anger cannot justify the rampant violence and theft occuring in South Africa, Malema too should never be given the chance to turn his rantings into government policy. That would be disastrous. But until the legitimate concerns that fuel such anger are resolved, and the middle and upper classes recognize their deep hypocrisy, we would be fools to believe that the Malemas in South Africa will be silenced by anyone for very long.